There are few obvious remains of the once extensive whinstone quarries behind the hamlet of Esk Valley. This overgrown lump of masonary was once a crusher next to the railway line. On the opposite bank of the river is a bridge parapet, here is where a tramway crossed to another quarry at Green End, on the other side of the river. Thanks for adding this one Chris. I have often walked through the area and seen the above remnants and always assumed they were linked to the ironstone industry. 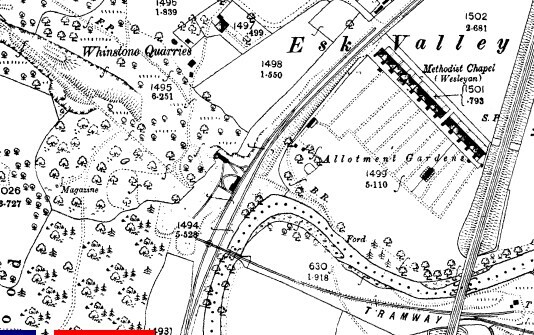 My knowledge of whinstone quarrying is very poor, although I have read about a ‘line’ of whinstone that runs through the area that passes Great Ayton. Would this be the same seam as runs through the Esk Valley area? Yes, that’s exactly what it is.